The ten machine puzzle in my Theory of Constraints blog post is a simple example of the balanced and dependent systems that are surprisingly frequent in the real world. Balanced because all elements have the same capacity. Dependent because events at one element affect the performance of other elements. Frequent because lean thinking drives people and organizations towards them. None work very well. How does this happen? Inventory, conveyance, motion, and over production are wastes that are relatively easily recognized and reduced. When these wastes are removed, waiting losses (blocks and starves) can replace them. In the extreme, system performance deteriorates as lean “improvements” are made. In isolation yes, in combination no is a primary lesson from Theory of Constraints. There are three options to improving balanced and dependent systems. The first is to improve the reliability of all of its dependent elements. That is lean thinking, but perfection is a high hurdle. In the ten machine puzzle, each machine’s reliability must be improved from 98% to 99.8% to achieve the 98% system availability target. Cumulative probability predicts that the perfection hurdle gets even higher for larger balanced and dependent systems. Take a process with 100 dependent steps, not unusual in manufacturing or business. If each element has a 98% reliability, the system will only be available 13% of the time. To achieve 98% system availability, the reliability requirement for each element is 99.98%. Ouch! The second option is to oversize each of the process elements. 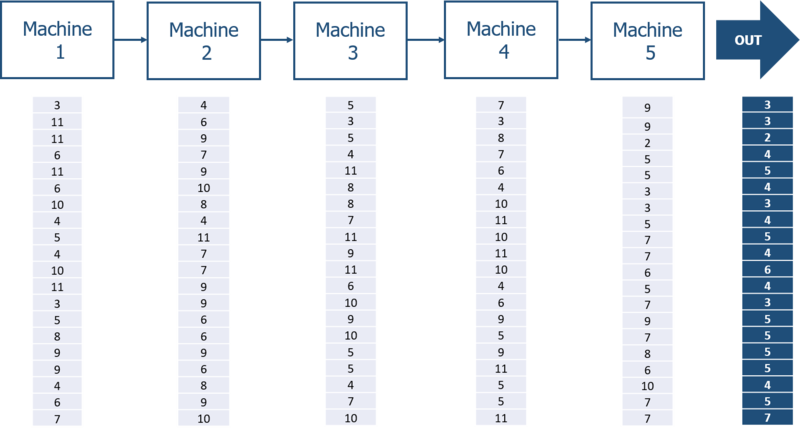 In the ten machine puzzle, oversizing each machine from 50 to 60 units per hour does the trick. With 100 process steps, each machine would have to be oversized by almost a factor of three…now that is expensive waste! The third (and by far the best) option is to decouple process elements with buffers and to unbalance capacities to create a distinct constraint. This option trades inventory and conveyance waste against overproduction and waiting. The trick is to find the optimum balance. Is the trick magic? No, not with discrete event simulation…the next blog’s topic. In my previous blog on Theory of Constraints, I defined the constraint (aka, the bottleneck) as the weak link in the chain. Every system has one. If there is a choice, where is the best constraint location? The Ugly. By far the worst place to have the constraint is in the marketplace. When the constraint is outside the four walls of a company’s operations, management’s control over it is very limited. Operational and financial performance is completely exposed to market turbulence: product and pricing actions by competitors, shifts in aggregate demand, changes in consumer tastes, and so on. In a perfect world, annual demand will exceed capacity by one unit per year. Why? Operational and financial performance can be optimized by managing the internal constraint while having only one unhappy customer. The Bad. An internal constraint should not be in a process that is unreliable, uncertain, or inflexible. The constraint is the “drum” that establishes the rhythm for the enterprise. If the constraint does not have a steady beat, then wastes of all types (especially inventory and waiting) will be incurred at non-constraints as they struggle to keep in step with the constraint. Processes with low availability and/or low process capability are also bad places for the constraint. The opportunity costs of production losses and scrap at the constraint are huge. An inflexible constraint is another bad idea. The entire organization will suffer if its constraint cannot quickly respond to shifts in consumer tastes or aggregate demand. Adding cost at the constraint (e.g., overtime, outsourcing, etc) to capture incremental profits is good business. Watching a more nimble competitor grab those dollars is not. The Good. A good constraint is inside the four walls of your operations and is reliable, certain, and flexible. Easy to say, harder to do. Choose a familiar technology…the constraint is no place for a steep learning curve. Minimize planned maintenance during shift hours. Cross-train employees for “instant” capacity at the constraint. Design the constraint to be flexible across a broad range of mix and sequence scenarios. Adequately buffer the constraint upstream and downstream to minimize block and starve waiting losses. At the constraint, all the little details matter.